Double Action is simple to play – just say “EITHER NUMBER CALLED, MARK THE SQUARE” and play the patterns you normally use. Fast Play = More games. Increased games x more sales = bigger profits. In speed-ball games, you’ll love the increased profit. Large numbers, easy to read. 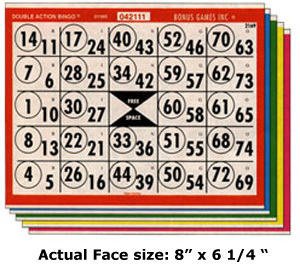 Large sheet, easy to play. 48 numbers on every card. 3,000 single cards per set.